IBC Commentary: The enforceability of a standard is established in this section, and applies wherever the provisions of this chapter do not otherwise indicate a requirement. Therefore, even if a standard is not referenced anywhere else within this chapter it will be applicable to such systems and equipment. For example, automotive lifts are addressed by the reference to ANSI/ALI ALCTV but no further requirements are found in Chapter 30. This standard is fully applicable to such automotive lifts. 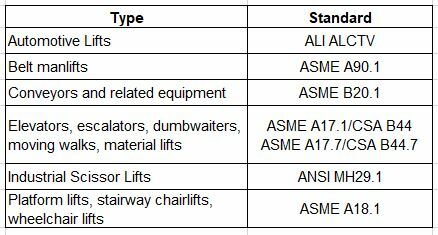 Table 3001.3 contains specific referenced standards and indicates the type of elevator and conveying system components and equipment to which those standards are applicable. Automotive Lift Institute Input: Alteration, repair, and maintenance of automotive lifts as presented in section 3001.2 shall conform to ALI ALCTV. Section 6 of ANSI/ALI ALCTV specifies the ANSI/ALI ALOIM Standard (current edition) for Operation, Inspection, and Maintenance. The ANSI/ALI ALOIM standard addresses alteration and maintenance as well as operator training and inspection. This clause is helpful to Authorities Having Jurisdiction when considering shops, not under the jurisdiction of OSHA, that do not currently practice lift maintenance or annual inspection.